China is moving fast towards Nepal to be its best neighbor, position currently occupied by India. A section of Indian establishment and media dislike Nepal’s widening ties with China. They believe that Nepal has gone a bit too far and too fast in enhancing relations with its northern neighbor. Nepal is important for China due to its geopolitical location between India and China. Three important developments have further deepened and widened Nepal China bonds. The first is the economic blockade imposed by India, the second is the One Belt One Road (OBOR) Initiative undertaken by China, and the third is China’s rise as the second most important global economic, military and political power. 3. China to build a regional international airport in Pokhara. The China’s One Belt One Road (OBOR) initiatives is a modern expanded version of ancient Silk Road. The OBOR agreement signed by Nepal and China have five broad areas – economic development; transport connectivity; trade connectivity (economic zone, industrial park, and dry port development); financial integration through opening branch of Chinese bank and People-to-people contact through visits and media cooperation. Before Sino-India war, Nepalese used to travel through ancient Silk Road as means of greater regional connectivity. Newar, Nepalese merchants used to conduct trade between Nepal, Tibet and Bengal, India over the Silk Road, and acted as a bridge for economic and cultural exchanges between South Asia and Central Asia. The thousand-year-old Lhasa Newar tradition came to an end after the caravan route linking India and Tibet through Sikkim was shut down by the Sino-Indian War in 1962. In fact, many Nepalis have no knowledge about Nepal’s relation with Tibet that it was easier and safe compared to travel towards South at least until the 19th century. As a Sociologist, Dor Bahadur Bista mentions, until the beginning the 19th century, Nepal shared a greater cultural affinity with and had more significant economic interest in Tibet than India. Also, there were more Nepalis in Tibet than anywhere else in South Asia. The dense sub-tropical forest to the south, with its diseases, wild animals, and evil spirits, dacoits and robbers were the primary causes to consider the southern border unsafe. By that time, Nepalis were more privileged in Tibet. For example, Nepalis businessmen could marry Tibetan women, and male offspring of such marriage was regarded as Nepali subjects (popularly known as Khachara) whereas a female child from such a marriage (Nepali father and Tibetan Mother) was acknowledged as a Tibetan citizen. The then Tibetan government had agreed to accept the arrangement and granted the Khacharas the privileges and facilities accorded to Nepali traders in Tibet. Around 600-650 CE, Nepalese Princess Bhrikuti got married to Songtsan Gampo, Emperor of Tibet. Princess Bhrikuti, as a part of her dowry, brought Buddhists relics and Thangkas to Tibet and establishing Buddhism as the Royal religion in Tibet. Bhrikuti is usually represented as Green Tara in Tibetan iconography. The Red Palace on Marpo Ri (Red Mountain) in Lhasa, which was later rebuilt into the thirteen story Potala Palace by the Fifth Dalai Lama, was constructed by Newari craftsmen according to her wishes. In 1260 CE during the Yuan dynasty, Newar craftsmen of Nepal Araniko, on the decree of Chinese/Mongolian Emperor Kublai Khan, traveled to Shangdu and built the White Stupa of Miaoying Temple in Beijing, which was the largest structure in Beijing at that time. Taking almost ten years (1279-1288 CE) to complete, the Stupa better known as White Dagoba is still standing today and is one of the oldest Buddhist Stupa in China. The Kerung route was opened in the 17th century which provided the ground to develop a closer interaction among China, Tibet, India, and Nepal. It was Tibet, which was paying an annual tribute of Rs. 10000.00 to Nepal until 1953. Moreover, Nepalese were freely allowed to visit pilgrimages to the holy Mt. Kailash in Tibet. Likewise, Tibetans allowed traveling to worship Buddhist temples in Nepal. Before reunification of Tibet into China, once Kathmandu was a prime center of trans-Himalayan communications and a meeting ground of traders of Nepal, British-India, and Tibet, people from major bordering points i.e. Kerung, Kuti were active in trade, tourism, and trekking related businesses. There were no restrictions on human movements to and from Tibet to Nepal. However, drastic paradigm shifts were observed not only on the trade but also on aspects of human mobility and other cultural relationship between two bordering neighbors after Chinese occupation of Tibet. Due to security concern in Tibet, slowly and deliberately the restriction on the people’s movement was imposed in the Nepal-Tibet border. After the reunification of Tibet, China raised significant concerns of security and tightened the border with Nepal. The 1950 Indo-Nepal Treaty of Peace and Friendship that had established a close Indo-Nepalese relationship on commerce and foreign relations was seen as an extension of Indian influence in Nepal; the deployment of an Indian military mission in Nepal China border in the 1950s and unabated migration of millions of Indian into Nepal’s Terai region increased these concerns. 1. Olangchungola (Tiptala Pass): It is the border point with the nearest Chinese market of Riwa Bazaar which is some 360 kilometers away from Indian market Panitanki/Galgalia. 2. Kimathanka (Lengdup): It is the border point with the nearest Chinese market of Riwa Bazaar which is some 400 kilometers away from Nepal-India border market of Jogbani. 3. Lamabagar (Lapchi): It is the border point with the nearest Chinese market of Phalek that is some 240 kilometers away from Bhittamode of India. 4. Gorkha Larke (Lajyang Pass): It is the border point with the nearest Chinese market of Kungtang which is some 420 kilometers away from Nepal-India border point-Thori. 5. Mustang (Korala): It is the border point with the nearest Chinese market of Zhongba which is some 448 kilometers away from Sunauli bazaar of Nepal-India border. 6. Mugu (Nagcha): It is the border point with the nearest Chinese market of Hyazimang which is some 374 kilometers away from Rupaidiya of India. 7. Humla (Hilsa): It is the border point with the nearest Chinese market of Sera which is some 473 kilometers away from Nepal-India border market of Gaurifanta. China cited April 2015 earthquake and its security as major causes of the shutdown of the Kodari-Khasa border highway. Then, China opened Rasuwagadi (Kerung) border highway; both are all weather trans Himalayan roads connecting Nepal with China. The inhabitants of internal borders of both sides are still interdependent on support for their daily necessities, and the primordial barter system of trade is still prevalent between Nepal and Tibet. Edible items like barley, milk products, rice, ﬂour, etc. are being exported to Tibet from Nepal and Nepal imports garments, salt, wool, edible items and electronics from Tibet. There are two trans-Himalayan highway between Nepal and China to provide modern road transport facilities also to the frontier inhabitants. But these highways are not enough to solve the transportation problems of entire borders. Therefore, yaks are being used on a massive scale on trails for transportation of cross-border barter trade. It is interesting to note that people of both the sides walk for many days with yaks across the snowy Himalayan frontiers to transport their items of daily necessities. China – Nepal relations have seen the maximum growth in the recent times. About half dozen Chinese airlines regularly fly to Nepal. Chinese tourists’ growth rate is highest in Nepal. Nepal gave permission to China to pick the 16 Himalayan districts bordering China to develop as part of poverty alleviation program. Moreover, China Nepal joint military exercise was a new chapter in security cooperation. Those freedom were earlier reserved for India, but now politicians in Kathmandu talk openly about maintaining equidistance between the two big neighbors on such matters. Some opposition leaders in Nepal say that case of Chinese soft power across the Himalayas is exaggerated so much that some international players play power games for the regime and government changes to check China in Nepal. China is heavily investing in infrastructure projects in Nepal becoming the highest investment partner. The two countries have agreed to develop border transmission line and two large hydroelectric power in Nepal. It is investing in road constructions and ring road expansion, hydro electric projects 750 MW West Seti and 1200 MW Kaligandaki , dry ports in Larcha and Syaprubesi highway points, World Peace City in Lumbini, creation of China Study Centers, an international airport in Pokhara, optical fiber cable connectivity from Kathmandu to Chinese border and a railway line connecting Lhasa and Nepal. 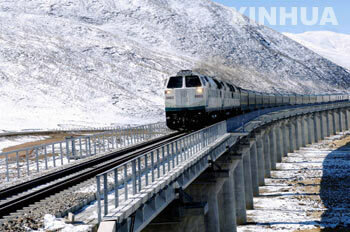 Chinese plan to extend the Qingzang railway to Nepalese border and its construction will be completed by 2020. It will start from Shigatse in Tibet to Katmandu, Nepal’s capital city. The designed top speed will only be 75mi/h (120km/h) at most, because of the remarkable elevation changes and challenging Himalayan terrain. The construction is scheduled to begin in 2020 and is expected to be done by 2022. After that, it will be extended up to Lumbini, birth place of Lord Buddha, near the border to India. The China policy towards Nepal is stable and free of complications. China deals with Nepal respecting it as a sovereign nation based on equality and non-interference. There are no disputes between two countries. The bilateral relations between Nepal and China have been friendly and defined by Nepal’s policy of balancing the competing influence of China and Nepal’s southern neighbor.